On Friday morning's The Early Show on CBS, viewers were treated to what seemed like a parody of Barack Obama's mainstream media paparazzi fawning over the Democratic President-elect, as the show ran a report exploring the question of "How cool is Obama?" and co-hosts Harry Smith and Tracy Smith referred to Obama as "the man" and "the epitome of cool," respectively. 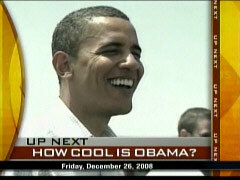 Audio of the classic rock group the Chiffons singing "He's So Fine" even played as the piece on Obama's "coolness" began. Tracy Smith oozed as she plugged the segment: "We're actually talking about how a lot of people think that President-elect Barack Obama is the epitome of cool. Look at that guy. Everything, I mean, even in a baseball cap. Don't you think?" After Harry Smith referred to a New York Times article about the significance of Obama spending his childhood in Hawaii, Tracy Smith effused: "That makes him even cooler." The Tuesday morning shows of NBC, ABC, and CBS all promoted Barack Obama's celebrity status as hosts and reporters ogled the latest paparazzi photo of Obama in swim trunks while on vacation in Hawaii, as NBC's Matt Lauer declared on Today: "And fit to serve, Barack Obama photographed shirtless in Hawaii and a lot of women are giving him the presidential seal of approval." On ABC's Good Morning America, co-host Diane Sawyer outlined Obama's workout routine: "...these photos of the first abs, which we've all been analyzing this morning. I just want to reminder you, to get those abs, he does standing triceps push-downs, shoulder presses, sit-ups with a high platform, one set of triceps, and calf raises." On the CBS Early Show, fill-in co-host Debbye Turner Bell held up the picture and announced: "Take a look at this. I'll be happy to pick this up!" Here's a textbook definition of bias by story placement in a newspaper. On Christmas Eve, the Washington Post placed the release of the Obama's transition team's report on contacts with Gov. Rod Blagojevich on page A3 -- headlined "Obama Report Clears Dealings with Blagojevich." Centered right underneath the headline in this four-column story was a gray two-column box with a sidebar headlined in capitals "OBAMA ATTENDS SERVICE FOR GRANDMOTHER." But on Christmas Day, this Obama story was on Page One of the Post: "As Duties Weigh Obama Down, His Faith in Fitness Only Increases." Newsweek sprinkled throughout its year-end double issue, with Barack Obama on the cover as the #1 member of "The New Global Elite," a bunch of potshots at Sarah Palin -- and even derided teen daughter Bristol too. In a list of those who committed "low behavior" during 2008 (which did at least also highlight John Edwards), the magazine accused Sarah Palin of a "smear" against Barack Obama, on another page Newsweek described her as an "ill-informed, inarticulate shopaholic" (while on the same page hailing MSNBC's Rachel Maddow as a "brilliant" woman who "gives libs a happy new voice") and deep in the December 29/January 5 edition the magazine ridiculed Bristol Palin: "For 30 years, the Moral Majority has promoted 'abstinence only.' Jamie Lynn Spears, Bristol Palin...how's that working out?" The New York Times, which last month mocked Sarah Palin for getting taken in by a French prank...got taken in by a French prank, printing a letter Monday (December 22) allegedly from Bertrand Delanoe, the Mayor of Paris, calling Caroline Kennedy's bid for a U.S. Senate seat as "appalling" and "not very democratic." 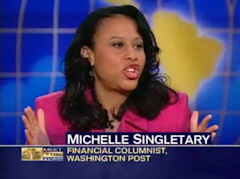 Declaring President George W. Bush's "economic legacy is selfishness" for daring to propose letting people invest a portion their Social Security payments in the stock market, on Sunday's Meet the Press the Washington Post's Michelle Singletary charged Bush "should be ashamed of what he's left us." The Post-based nationally-syndicated "Color of Money" personal finance columnist contended that as a "regular mom and churchgoer" she's "just so disheartened by what Bush did to us" economically by "fighting a war that we couldn't win." She got the last word, an overly dramatic one at that, during the panel's assessment of Bush's legacy: "He did all of this, I think, at the detriment of our country, our economy. And I think the regular American people are sitting here going, 'We're in this war, and you said you couldn't afford health care, and yet all these billions of dollars are over there. And I have no job, no health care and probably no house.'" Just before 8am Eastern time on the Tuesday edition of CNN's American Morning, anchor John Roberts interviewed Joe "The Plumber" Wurzelbacher, and something unusual happened. After a battery of questions from Roberts suggesting Joe was throwing John McCain "under the bus," Joe shot back that the media does that to candidates it supports. Roberts took offense, since "I'm a journalist," and Joe laughed at that. Roberts insisted Joe should not cast aspersions against him, and Joe said he didn't mean to attack Roberts personally, but the news media are "very slanted to the left." The winning quotes in the MRC's "Best Notable Quotables of 2008: The Twenty-First Annual Awards for the Year's Worst Reporting." As noted in a CyberAlert Special last Monday, the awards issue was posted, with videos, on Monday, December 22, but following tradition, today, Tuesday and Wednesday -- the last weekdays of the year -- CyberAlert will run the winning quotes followed on succeeding days by the runners-up. MSNBC's Chris Matthews earned the dubious honor of "Quote of the Year" for the Hardball anchor's gushing reaction to a Barack Obama speech back in February: "I felt this thrill going up my leg. I mean, I don't have that too often....And that is an objective assessment." Matthews edged out Reuters news service, which "won" second place for this ridiculous post-election headline: "Media bias largely unseen in U.S. presidential race." MRC.org features the online posting with audio/video (click-and-play Flash video, as well as downloadable Windows Media video and MP3 audio clips), a PDF and downloadable text. In recognition of their time and effort, a listing of the names and affiliations of the 44 judges for the "Best Notable Quotables of 2008: The Twenty-First Annual Awards for the Year's Worst Reporting." On Friday morning's The Early Show on CBS, viewers were treated to what almost seemed like a parody of Barack Obama's mainstream media paparazzi fawning over the Democratic President-elect, as the show ran a report exploring the question of "How cool is Obama?" and co-hosts Harry Smith and Tracy Smith referred to Obama as "the man" and "the epitome of cool," respectively. Audio of the classic rock group the Chiffons singing "He's So Fine" even played as the piece on Obama's "coolness" began. Tracy Smith oozed as she plugged the segment: "We're actually talking about how a lot of people think that President-elect Barack Obama is the epitome of cool. Look at that guy. Everything, I mean, even in a baseball cap. Don't you think?" After Harry Smith referred to a New York Times article about the significance of Obama spending his childhood in Hawaii, Tracy Smith effused: "That makes him even cooler." Later during the 8:00 a.m. hour, Harry Smith introduced the report, which featured soundbites from GQ magazine's Adam Rapoport and Joyce Corrigan of Marie Claire: "Many people are fascinated by President-elect Obama. They think he's cool. So just how cool is he? We asked some people in the know." After the report started with an audio clip of the Chiffons singing "He's so fine," Rapoport declared that Obama "is someone that you look up to in sort of a pop culture way." After a clip of Rapoport talking about how unreal it feels that someone as "cool" as Obama could be President, Harry Smith gushed that GQ also says Obama is "the man": "But that's exactly what Barack Obama will be. And as if being leader of the free world isn't enough, GQ magazine says the man is also 'the man.'" Then came a soundbite of Rapoport: "Obama is one of those guys, and you're just like, 'That guy is a man.' He is a man, and everyone around him knows it, and he knows it." Corrigan compared Obama to a "male model" and, after another clip of Rapoport, Harry Smith continued: "On a 'cool guy' checklist, the style experts think Obama qualifies in just about every category." HARRY SMITH: But be wary of Obama worship. ROBERT THOMPSON, SYRACUSE UNIVERSITY PROFESSOR OF TELEVISION AND POP CULTURE: The Barack Obama administration right now is like the days before Christmas. There's all this great stuff under the tree, and it's all promise. Pure magic might be in there. Unfortunately, in those boxes might be a lot of good things, but there's a lot of bad things that are going to be in those boxes as well. The report ended as the final soundbite of Rapoport returned to the overall pro-Obama theme: "We'll see how the next four years go, but so far, he's walked the walk and talked the talk. And I think, as a guy, you really dig that." HARRY SMITH: Welcome back to The Early Show. I'm Harry Smith, along with Tracy Smith, and Maggie and Julie are off today. TRACY SMITH: We're talking about being cool. TRACY SMITH: I mean, you're cool, but we're actually talking about how a lot of people think that President-elect Barack Obama is the epitome of cool. TRACY SMITH: Look at that guy. Everything, I mean, even in a baseball cap. TRACY SMITH: Don't you think? HARRY SMITH: There was a whole thing in the Times yesterday about his being from Hawaii and a kind of a zen of what it's like to be from Hawaii and that's, how that might serve him well in the days and months to come. TRACY SMITH: That makes him even cooler. There is one fashion faux-pas that he commits, and we'll talk about that also, coming up. TRACY SMITH, BEFORE COMMERCIAL BREAK AT 8:16 a.m. Up next, from his aviator sunglasses to his wing-tipped shoes, lot's of people think Barack Obama is cool. A look at the President-elect's style when we come back. HARRY SMITH: Many people are fascinated by President-elect Obama. They think he's cool. So just how cool is he? We asked some people in the know. CLIP OF THE CHIFFONS SINGING THE SONG "HE'S SO FINE": Do-lang, do-lang. He's so fine. Do-lang, do-lang, do-lang. ADAM RAPOPORT, GQ MAGAZINE: The President, all of a sudden, is someone that you look up to in sort of a pop culture way, as kind of a remarkably exciting person to have in charge of us. HARRY SMITH: Adam Rapoport, the style editor at GQ magazine, knows a thing or two about cool. RAPOPORT: So I got my little Obama picture here in my desk drawer, which, when I saw this in the Times a few weeks ago, I was just like, all right, that's not fair, that is too cool, he can't possibly be President of the United States. HARRY SMITH: But that's exactly what Barack Obama will be. And as if being leader of the free world isn't enough, GQ magazine says the man is also "the man." RAPOPORT: Obama is one of those guys, and you're just like, "That guy is a man." He is a man, and everyone around him knows it, and he knows it. JOYCE CORRIGAN, MARIE CLAIRE: This is Barack Obama coming off his jet on the campaign trail, and it's almost like a male model image, you know, he's casual with his hand in his pocket, no tie, loosened shirt top. It's just altogether, you know, black, white and gray is about as classy as you can get. RAPOPORT: He looks great without the tie, with the sleeves rolled up. Some of the older politicians, they wear that look and it looks like, [SAID WITH SARCASM] "I'm rolling my sleeves up, I'm getting to work." Obama, he's not trying to make a point by dressing this way. That's the way he dresses. HARRY SMITH: On a "cool guy" checklist, the style experts think Obama qualifies in just about every category. CORRIGAN: He's got a perfect, sort of, size 40 long, which is a male model size. RAPOPORT: He can throw on the baseball cap and look like I actually own this cap and I wear it regularly. CORRIGAN: Aviator glasses, cool wing-tip shoes. RAPOPORT: You see those girls, and they're just so beautiful and so happy. It's kind of this classic American family. HARRY SMITH: Rapoport says Obama is guilty, though, of one fashion faux-pas. RAPOPORT: He could use some help in the jeans department. He's kind of got the high-waisted bad jeans going. Don't love those. HARRY SMITH: Yet, there are plenty of other things he does right. RAPOPORT: Listen, there's a lot of guys that will play golf, there's a lot of guy who plays tennis. That's not cool, you know. If you can ball, if you can be on the courts, if you can walk down to the gym and get a little pick-up game going, that's cool. Presidents don't do that. BARACK OBAMA: You know, I've got pretty eclectic tastes. I've got everything from Miles Davis to Stevie Wonder to Frank Sinatra to Jay-Z. RAPOPORT: We'll see how the next four years go, but so far, he's walked the walk and talked the talk. And I think, as a guy, you really dig that. The Tuesday morning shows of NBC, ABC, and CBS all promoted Barack Obama's celebrity status as hosts and reporters ogled the latest paparazzi photo of Obama in swim trunks while on vacation in Hawaii, as NBC's Matt Lauer declared on Today: "And fit to serve, Barack Obama photographed shirtless in Hawaii and a lot of women are giving him the presidential seal of approval." On ABC's Good Morning America, co-host Diane Sawyer outlined Obama's workout routine: "...these photos of the first abs, which we've all been analyzing this morning. I just want to reminder you, to get those abs, he does standing triceps push-downs, shoulder presses, sit-ups with a high platform, one set of triceps, and calf raises." Fellow co-host Chris Cuomo added: "The most important thing that he does to be fit, is his diet. He's very careful about his diet. He's in good shape, certainly for a man his age. But I think it's how he eats." 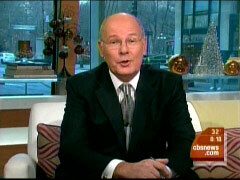 On the CBS Early Show, co-host Harry Smith proclaimed: "Obama in Awahu. Why he's getting a lot of attention." Smith later referenced a newspaper cover with the shirtless picture of Obama: "This picture is in a lot of papers around the country...'Fit For Office.'" Meanwhile, fill-in co-host Debbye Turner Bell held up the paper and announced: "Take a look at this. I'll be happy to pick this up!" While all three December 23 shows were eager to show the photos of the President-elect, all were concerned with his privacy at the same time. On NBC's Today, correspondent Samantha Guthrie explained: "Secluded behind a tight Secret Service barrier, glimpses of Obama in vacation mode are rare. Not surprisingly, he draws a crowd on any venture out, like after his daily workout Monday." On ABC's GMA, Cuomo went so far as to ask: "You will be seeing this picture a lot. However, they are not enjoying it in private. This morning, many are wondering how did a photographer get these pictures? He got within 200 feet of the incoming president, apparently without any action by Secret Service. So what was going on?" Only NBC's Today brought up the expense of the vacation, as Lauer asked NBC political director Chuck Todd: "Hey, let me touch briefly on this vacation for the Obama family...I've read some comments in the last day or two, some pretty snarky, about this home they're renting. Is this a big deal? I mean, they don't have a ranch, they don't have Hyannisport or Newport from the Camelot days. They're renting a home. Is it a big deal?" Todd dismissed it as an issue: "Well, don't forget Kennebunkport or the Reagan Santa Barbara ranch, no I don't think it's that big a deal in this sense, this is where they've gone every year...it's not like they picked this out of a hat or they said, you know, 'let's go to the chi-chiest place we could find somewhere in the United States.'" Being elected President forces a man to take inventory of his life, so Barack Obama has trimmed his schedule to the bare essentials. He's not in the White House yet, but gone are the hours he once spent reading novels, watching television, and obsessing over the daily transactions of Chicago's sports teams. He eat out only once every few weeks. He visits friends rarely, if at all. But one habit endures: Obama has gone to the gym for about 90 minutes a day, for at least 48 days in a row. He has always treated exercise less as recreation than requirement, but his devotion has intensified during the last few months. Between workout during his Hawaii vacation this week, he was photographed looking like the paradigm of a new kind of presidential fitness, one geared less toward preventing heart attacks than winning swimsuit competitions. The sun glinted off his chiseled pectorals sculpted during four weightlifting sessions each week, and a body toned by regular treadmill runs and basketball games." The story continued inside with the headline "Gym Workouts Help Obama Carry the Weight of His Position." It was accompanied by a large picture of Obama playing basketball against a University of North Carolina player named Jack Wooten. Placed clumsily next to the photo was another gray two-column text box with the headline "OBAMA SPEAKS OF AMERICAN COURAGE." Post reporter Philip Rucker wrote what amounted to a nice press release for Obama's holiday radio address: President-elect Barack Obama released a sobering message for the nation on Christmas Eve, recognizing the sacrifice of the country's service men and women while calling on Americans to find inspiration in a founding father to overcome current economic struggles." It was George Washington, as Obama recalled crossing the Delaware on Christmas 1776. Rucker continued: "On a day when the nation's unemployment fiings reached a 26-year high, Obama turned to Washington to stoke hope in the battered American workforce." There was no mention of a Republican rebuttal, and it's obvious the Post wasn't offering any kind of balance to these stories carrying the servile tone of transition-team public relations. "It's something he takes seriously, and that's why he's in great shape," said Alexi Giannoulias, a friend of Obama's and a former professional basketball player. "When people picture him running or whatever, they might think he's just going through the motions. But he goes hard. He's fit. He could convince you he's half his age." For the small group of reporters tasked with following Obama's every move, his fitness has become a running joke repeated in the stories they file. They sit at McDonald's while he exercises in Hawaii. They eat calorie-rich scones while he sweats at Regents Park. One reporter for the Christian Science Monitor, filing his report about one of the president-elect's gym trips last month, noted: "While Mr. Obama worked at maintaining his lithe look, your pear-shaped pooler spent quality time at a local coffee shop." Obama still suffers from one vice -- smoking -- although he has worked hard to quit since he started the presidential campaign. He's down from three or four cigarettes each day to what he terms the occasional "slip." It's a schedule he started as a 22-year-old student at Columbia University in New York, and it immediately transformed him. In his 1995 autobiography, "Dreams From My Father," Obama said he was a casual drug user and an underachiever until he decided to start running three miles each day. He stopped staying out late, fasted on Sundays and became a voracious reader, spending most of his time alone in his apartment reading classic literature and philosophical texts. Physical fitness yielded mental fitness, Obama decided, and the two concepts have been married in his mind ever since. "It's always been a priority in his daily routine," said Christopher Lu, a marathon runner who worked as Obama's legislative director in the Senate and was named Cabinet secretary last week. "I think it's an example of how disciplined he is. It's one of the things that really keeps him balanced." Obviously, the Post doesn't seem to make any kind of attempt to keep itself balanced. It shows few signs it's paying any attention to departing ombudsman Deborah Howell's advice to stop tilting the news in Barack's direction. They look too distracted by the glint off his "chiseled pectorals." # Page 21, a list of "The Biggest Losers" of 2008 "who set the high-water mark for low behavior in 2008," featured Palin: "In a smear that sounds even worse in retrospect, Sarah Palin goes rogue and stirs up prejudice by accusing Barack Obama of 'palling around with terrorists.'" - "Sarah Palin: Ill-informed, inarticulate shopaholic has ego bigger than Alaska -- and she's still the darling of the GOP." - "John McCain: Hard to forgive the nasty end-game, and Palin pick was irresponsible. But classy concession speech and Letterman gig." - "Rachel Maddow: Brilliant, ebullient, lefty lesbian gives libs a happy new voice. Will MSNBC be Obama's Fox?" - "Christian Right: For 30 years, the Moral Majority has promoted 'abstinence only.' Jamie Lynn Spears, Bristol Palin...how's that working out?" 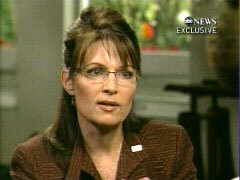 - "Sarah Palin: She seemed like McCain's silver bullet...until she opened her mouth. A 2012 contender if she starts boning up on issues. Now." In Monday's newspaper, we published a letter over the name of the mayor of Paris, Bertrand Delanoe, criticizing Caroline Kennedy. This letter was a fraud and should not have been published. Mr. Delanoe's office has since confirmed that he did not write it. The Times has expressed its regret to Mr. Delanoe's office for the lapse in judgment that led to this error. We now express those regrets to our readers. One of the last straws for the McCain advisers came just days before the election when news broke that Ms. Palin had taken a call made by Marc-Antoine Audette. Mr. Audette and his fellow comedian Sebastien Trudel are notorious for prank calls to celebrities and heads of state. Ms. Palin appeared to believe that she was talking to President Nicolas Sarkozy of France, even though the prankster had a flamboyant French accent and spoke to her in a more personal way than would be protocol in such a call. At one point, he told Ms. Palin that she would make a good president some day. "Maybe in eight years," she replied. "He did all of this, I think, at the detriment of our country, our economy. And I think the regular American people are sitting here going, 'We're in this war, and you said you couldn't afford health care, and yet all these billions of dollars are over there. And I have no job, no health care and probably no house.'" # "His economic legacy is selfishness. You know, you look at what they wanted to do to Social Security. Imagine if our money was in the markets right now, which is one of the things that he wanted to do. I think this, this administration failed on so many levels when it came to the economy, including not regulating the banks and letting things happen that shouldn't have happened with the mortgage industry. And, you know, he should be ashamed of what he, what he's left us." # "You know, I listen to this conversation, and I'm sort of thinking, you know, as the, as the regular, you know, mom and, and churchgoer, and I'm thinking, you know, all this -- I'm just so disheartened by what Bush did to us, and, and all this focus on fighting a war that we couldn't win. I mean, all the generals sort of told you that going in. And you said sometimes stubborn. He wasn't sometimes stubborn, he was always stubborn. And, and he did all of this, I think, at the detriment of our country, our economy. And I think the regular American people are sitting here going, 'We're in this war, and you said you couldn't afford health care, and yet all these billions of dollars are over there. And I have no job, no health care and probably no house.'" But that's not the case if the "average Joe" is accomplishing some liberal objective -- take, for example, Cindy Sheehan. She wasn't subjected to rough questioning from the liberal media. That's not even the case if you're a media-appointed political savior, like Barack Obama. We nominated Roberts on our Best of Notable Quotables ballot in the category "
JOHN ROBERTS: I want to just stipulate at the beginning of this interview, we are declaring a Reverend Wright-free zone today. So, no questions about Reverend Wright. Our viewers want us to move on, so this morning we're going to move on. Is that okay with you? JOE WURZELBACHER, AUTHOR: I'm not throwing him under the bus, the things I spoke about, his voting records, I mean that's factual. You know, we talked about -- he wanted to make other senators famous for having pork ,you know, in a bill, and yet he goes back to Washington, you know, suspends his campaign and goes back to Washington and votes for a $700 billion bailout, when Americans are in a time of need. You know we're taken advantage of and money is you know, 'you wash my back, I'll wash yours.' Money was thrown, you know, Michigan International Speedway got what, $250,000? So many other different organizations received pork. So it's not that I'm throwing John McCain on the bus. I have said it in my book, I respect John McCain for the service he provided our country, and, but as far as his voting record, I mean, you know, he proposed the amnesty bill for the illegal aliens. And I mean, that got a lot of negative publicity, a lot of, you know, opinion polls you know, proved the American people don't want it, yet they don't listen to us. So I'm not throwing McCain under the bus. That's just factual and that's what happened. ROBERTS: But I guess the throwing him under the bus aspect of this Joe, comes in from the idea that you were out there on the campaign trail, you were stumping for John McCain, you didn't say anything about it then. He loses the election. Now you're writing a book for profit, saying all of these things about him. Many people take that as throwing him under the bus. If you felt so strongly about it during the campaign, why didn't you say something then? WURZELBACHER: Well no, it's not so much that people are saying I'm throwing him under the bus, the media is saying I'm throwing him under the bus. So you know, let's correct that. You know, let them make the decision when they read the book. You know, so far I have heard that and it's been written about in the last couple of weeks since the interview with Glenn Beck, that I've thrown him under the bus. But that's just what I heard from the media. It's not what I heard from the general populace of America. Like I said, so they read the book, they can decide if I have thrown them under the bus, I just stated facts. I just stated facts about other politicians as well. So it's not, you know, I'm not singling John McCain out, he just happens to be the one I got to meet and you know, work with for six hours. So he's a good example that I can use. The winning quotes in the MRC's "Best Notable Quotables of 2008: The Twenty-First Annual Awards for the Year's Worst Reporting." As noted in a CyberAlert Special last Monday, the awards issue was posted, with videos, on Monday, December 22, but following tradition, today, Tuesday and Wednesday -- the last weekdays of the year -- CyberAlert will run the winning quotes followed on succeeding days by the runners-up. The Media Research Center's annual awards issue provides a compilation of the most outrageous and/or humorous news media quotes from 2008 (December 2007 through November 2008). To determine this year's winners, a panel of 44 radio talk show hosts, magazine editors, columnists, editorial writers, and expert media observers each selected their choices for the first, second and third best quote from a slate of five to eight quotes in each category. First place selections were awarded three points, second place choices two points, with one point for the third place selections. Point totals are listed in the brackets at the end of the attribution for each quote. Each judge was also asked to choose a "Quote of the Year" denoting the most outrageous quote of 2008. "What of the attacks has busted through to you? What makes you angriest at John McCain, the Republicans? What's being said about your husband that you want to shout from the mountain tops is not true?" Reporter Deborah Solomon: "You helped re-elect Bush in '04 when you gave $3 million to the Swift Boat campaign to discredit John Kerry's Vietnam service. Do you regret your involvement?" Businessman T. Boone Pickens: "Why would I?" Solomon: "Because it's such an ugly chapter in American political history." Pickens: "Oh, I see. Well, it was true. Everything that went into those ads was the truth." Solomon: "Really? I thought it was all invented." "To see his [Jeremiah Wright's] career completely destroyed by three 20-second soundbites, all of the work he has done, his entire legacy gone down the drain, has been absolutely devastating to me -- to him, sorry....We are still a racist country....I think that so many white people who had never been inside a black church were absolutely shocked by the tone and language that they heard [from Wright]....I think it brought out a lot of latent racism." "As a final crash of self-indulgent nonsense, when the incontrovertible truth of your panoramic and murderous deceit has even begun to cost your political party seemingly perpetual congressional seats....When somebody asks you, sir, about the cooked books and faked threats you foisted on a sincere and frightened nation; when somebody asks you, sir, about your gallant, noble, self-abnegating sacrifice of your golf game so as to soothe the families of the war dead; this advice, Mr. Bush: Shut the hell up! Good night and good luck." "Today, the audacity of hope had its rendezvous with destiny. No mere endorsement this, more like a political anointment from the Kennedys, merging ideals from two different eras....Obama is now an adopted son of Camelot. His candidacy blessed not just by the Lion of the Senate, patriarch of the clan, but by JFK's daughter." "It's early April, which means these are the few days of the year when Americans of almost every political stripe unite in a perennial ritual: complaining about taxes. Count me out. I'm happy to pay my fair share to the government. It's part of my patriotic duty -- and it's a heckuva bargain.... There seems to be an inconsistency about people who insist on wearing flag pins in their lapels, but who grumble about paying taxes....Genuine patriots don't complain about their patriotic obligations....Pay up and be grateful!" "Not doing it [fighting global warming] will be catastrophic. We'll be eight degrees hotter in ten, not ten but 30 or 40 years, and basically none of the crops will grow. Most of the people will have died and the rest of us will be cannibals. Civilization will have broken down." "As we know this morning, there is another ground-breaking, crossroads moment. That is for Senator Hillary Clinton, who ran her campaign on her own terms. This woman, as we said, forged into determination and purpose her whole life. As someone said, '€˜No thorns, no throne; no gall, no glory; no cross, no crown.'" Co-host Harry Smith: "In which ocean are the South Sandwich Islands located? A sixth grader from Nebraska answered that question. It's in the -- is it in the Atlantic? I thought the Sandwich Islands were actually named after the Earl of -- it's Hawaii. That's not right. I'm so sorry. Other -- you know what, let's-" Co-host Julie Chen: "No, it's in which ocean, so that is right. So it's the Atlantic Ocean." Smith: "Hawaii is not in the Atlantic Ocean." Chen: "Oh, it's in the Pacific." "Since he lost the election, Al Gore has become a certified celebrity, a popular prophet of global warming....When Al Gore ran for President in 2000, he was often ridiculed as inauthentic and wooden. Today, he is passionate and animated, a man transformed....What about the idea of the honest broker who goes to the two candidates [Barack Obama and Hillary Clinton] and helps push one or the other of them off to the side?...He's not ruling it out, but he says he already has a job -- as he puts it, '€˜PR agent for the planet.'" Keith Olbermann: "For 42 minutes, not a sour note and spellbinding throughout in a way usually reserved for the creations of fiction. An extraordinary political statement. Almost a fully realized, tough, crisp, insistent speech in tone and in the sense of cutting through the clutter....I'd love to find something to criticize about it. You got anything?" Chris Matthews: "No. You know, I've been criticized for saying he inspires me, and to hell with my critics!...You know, in the Bible they talk about Jesus serving the good wine last, I think the Democrats did the same." Author/humorist P.J. O'Rourke: "It's the twilight of the radio loud-mouth, you know? I knew it from the moment the fat guy-" Host Bill Maher: "You mean Rush Limbaugh and Sean-" O'Rourke: "-from the moment the fat guy refused to share his drugs...." Maher: "You mean the OxyContin that he was on?...Why couldn't he have croaked from it instead of Heath Ledger?" "I'd like to tip off law enforcement to an even larger child-abusing religious cult. Its leader also has a compound, and this guy not only operates outside the bounds of the law, but he used to be a Nazi and he wears funny hats. That's right, the Pope is coming to America....If you have a few hundred followers, and you let some of them molest children, they call you a cult leader. If you have a billion, they call you '€˜Pope.' It's like, if you can't pay your mortgage, you're a deadbeat. But if you can't pay a million mortgages, you're Bear Stearns and we bail you out. And that is who the Catholic Church is: the Bear Stearns of organized pedophilia....The Church's attitude: '€˜We're here, we're queer, get used to it,' which is fine. Far be it for me to criticize religion." Co-anchor Chris Matthews: "I have to tell you, you know, it's part of reporting this case, this election, the feeling most people get when they hear Barack Obama's speech. My -- I felt this thrill going up my leg. I mean, I don't have that too often." Co-anchor Keith Olbermann: "Steady." Matthews: "No, seriously. It's a dramatic event. He speaks about America in a way that has nothing to do with politics. It has to do with the feeling we have about our country. And that is an objective assessment." -- Exchange during MSNBC's coverage of the Virginia, Maryland and Washington D.C. primaries, February 12. # Tomorrow (Tuesday): The first runners-up quotes. In recognition of their time and effort, a listing of the names and affiliations of the judges for the "Best Notable Quotables of 2008: The Twenty-First Annual Awards for the Year's Worst Reporting." As explained in item #8 above, the panel of 44 radio talk show hosts, magazine editors, columnists, editorial writers and expert media observers received a ballot and each selected their choices for the first, second and third best quote from a slate of five to eight quotes in each category.